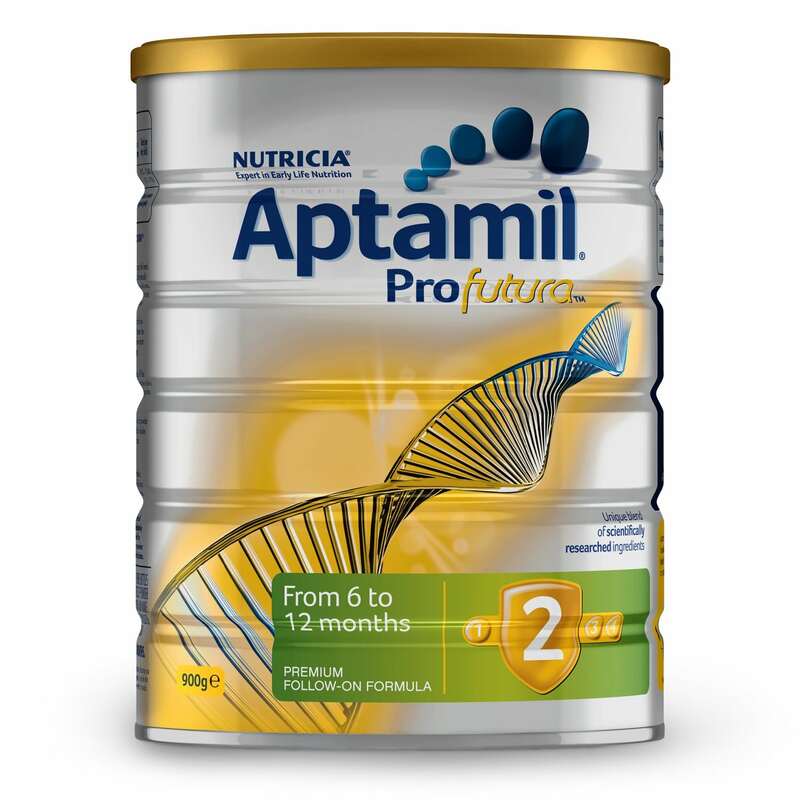 Aptamil® Profutura Follow-On Formula From 6 to 12 Months is a premium follow-on formula. 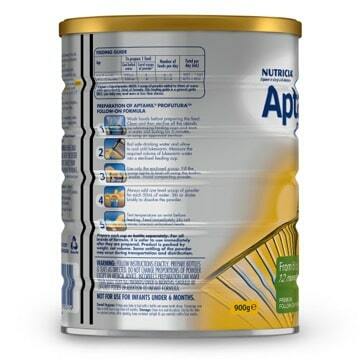 Aptamil® Profutura 2 Follow-On Formula is a premium follow-on formula for babies from 6 months to 1 year of age and meets the nutritional requirements of formula fed infants as part of a mixed diet. Aptamil Profutura is Nutricia's most advanced formulation featuring a unique blend of scientifically researched ingredients to help build strong foundations for your baby's future progress. Aptamil Profutura is specially formulated to nutritionally support the needs of your baby. Nucleotides: Cytidine 5'- Monophosphate, Uridine 5'- Monophosphate, Adenosine 5'- Monophosphate, Inosine 5'- Monophosphate, Guanosine 5'- Monophosphate. Not for use for infants under 6 months. Aptamil Profutura Follow-on Formula is based on cows' milk protein. Breast milk is best for babies. Before you decide to use this product, consult your doctor or health worker for advice. Meets the nutritional needs of formula fed infants as part of a mixed diet. Dental Hygiene: Putting your baby to bed with a bottle can cause tooth decay. Encourage your baby to drink from a cup from 6-8 months. Milk Solids, Vegetable Oils (Contains Soy, Antioxidant (Ascorbyl Palmitate, Citric Acid)), Galacto-oligosaccharides (Contains Milk), Dried Omega LCPUFAs (Contain Fish, Milk, Soy, Antioxidant (Mixed Tocopherols, dl-alpha Tocopherol, Ascorbyl Palmitate, Sodium Ascorbate, Citric Acid)), Long Chain Polyfructose, Emulsifier (Soy Lecithin), Taurine, Choline Chloride, Bifidobocterium Breve M-16v (570 Million cfu/100mL), L-carnitine, Inositol. Mineral: Potassium, Calcium, Chloride, Phosphorus, Sodium, Magnesium, Iron, Zinc, Copper, Iodine, Manganese, Selenium. Nucleotides: Cytidine-5'-monophosphote, Uridine-5'-monophosphate, Adenosine -5'-monophosphate, Inosine -5'-monophosphate, Guanosine -5'-monophosphate. Minerals: Potassium, Calcium, Chloride, Phosphorus, Sodium, Magnesium, Iron, Zinc, Copper, Iodine, Manganese, Selenium. Vitamins: Vitamins (A, B1, B2, B3, B5, B6, B12, C, D, E, K1), Folic Acid, Biotin. 1 scoop = 7.7g of powder. Note: 1 scoop of powder added to 50mL of water yields approximately 56mL of formula. This feeding guide is a general guide only; your baby may need more or less than shown. 2. Boil safe drinking water and allow to cool. Measure the required volume of water into a sterilised feeding bottle. 3. Use only the enclosed scoop. Fill the scoop lightly and level off using the built-in leveller. Avoid compacting powder. Prepare each bottle separately. For all brands of formula, it is safer to use immediately after they are prepared. Product is packed by weight, not volume. Some settling of the powder may occur during transport and distribution. Not for use in infants under 6 months.